W hat kind of pizza do you want? It's a simple, common question that most pizza-loving Americans don't give nearly enough thought, usually tossing off a halfhearted "pepperoni, I guess," or worse, mumbling something about avoiding gluten. The pizzaverse is vast and varied, and even its most voracious eaters likely haven't sampled all the palate-pleasing styles out there. "Whatever, I've been to Chicago," you say. YOU KNOW NOTHING. Have you been to Valley Forge, the old mining town in Pennsylvania with a delicious pizza style all its own? Have you ever had a pizza where the crust came out of a deep fryer? Have you frequented places where they swear by putting the cheese on cold after the crust is cooked? If you answered "no" to any of these, it's clear you need to add some entries to your pizza bucket list. Luckily, we've dug deep on all the different styles of pizza you need to try before your pizza-eating life is complete. Sure, certain pizza purists will cast a skeptical eye at certain pizza permutations and derisively deem them "not pizza," but we believe the glorious trinity of cheese, sauce, and carbs deserves to be celebrated in all its forms. Here are the 29 most compelling ways we consume pizza in 2018, from tried-and-true traditions to burgeoning trends that might soon occupy an oven (or better yet, stomach) near you. Dig in. What it is: The pizza bagel is -- simply -- traditional pizza toppings (tomato sauce, cheese, pepperoni) on a (usually) toasted bagel. And when pizza's on a bagel, you can eat pizza any time. Where it came from: For such a seemingly simple concept, the pizza bagel has a convoluted history. Richard Katz of Katz Bagel Bakery -- a Chelsea, Massachusetts bagel shop -- claims his grandfather invented the pizza bagel in the 1970s. On the left coast, Bruce Treitman (now a financial advisor for Deutsche Bank) claims he invented it while playing around with ingredients in the back of a Western Bagel as a teenager, years before Katz's pizza bagels were "invented." Either way, the pizza bagel has become a beloved novelty that bends the conception of what pizza can be. "Pizza is so unique amongst food, in that it is almost always adapted and remade to fit new and evolving tastes, especially when introduced to new cultures" said Dan Bransfield, author of Pizzapedia: The Illustrated Guide to Pizza. 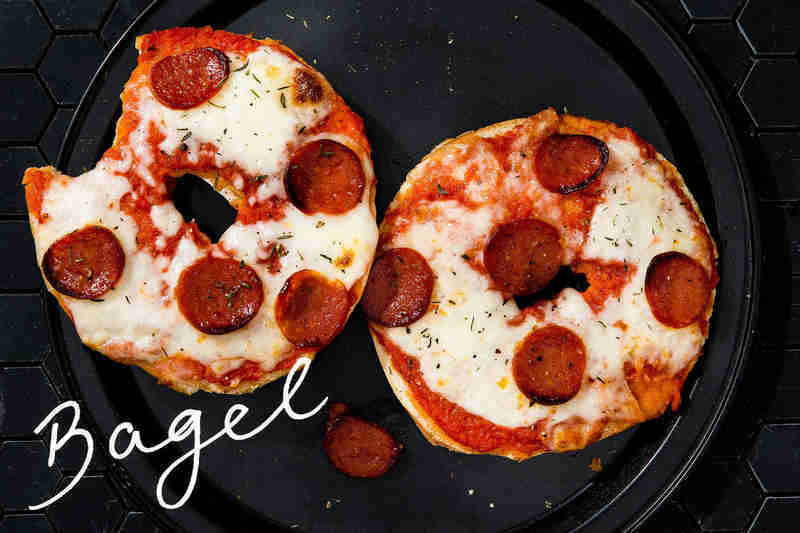 "With the pizza bagel, we took two foods everyone loves, and combined them. It's a testament to the flexibility of pizza as a concept, no matter where it came from." Where to get it: The aforementioned Katz Bagel Bakery is still churning out pizza bagels for their fans (and continue to insist they are the true and rightful visionaries behind the idea), although Western Bagel is still serving up their original recipe for pizza bagels, too, all across Southern California. If you want to avoid any and all debate (and are in New York City), Black Seed's pizza bagel -- placed atop their trademark Montreal-style bagels -- is a drama-free option that is just as good as either. And if you're in none of these places, there are always Bagel Bites. What it is: Well, it's exactly what it sounds like: the pizza "vehicle" is used to facilitate traditional breakfast foods in order to fashion a pie worthy of the day's most important meal. Breakfast pizza commonly features potatoes, bacon and/or sausage, cheese. But it almost certainly requires a cracked, golden egg on top of it all to truly be considered a breakfast pie. You don't have to eat this pie in the morning, but it's definitely become a brunchtime staple. Where it came from: While it's difficult to pin down exactly where the idea of putting breakfast atop a pizza was initially conceived, the impetus behind it is evident with the increasing popularity. "It's a style that has really rose to prominence over the past decade or so," said Dan Bransfield, author of Pizzapedia: The Illustrated Guide to Pizza. "As brunch became more popular, so did the breakfast pizza. Now, you can find it on menus across the country." 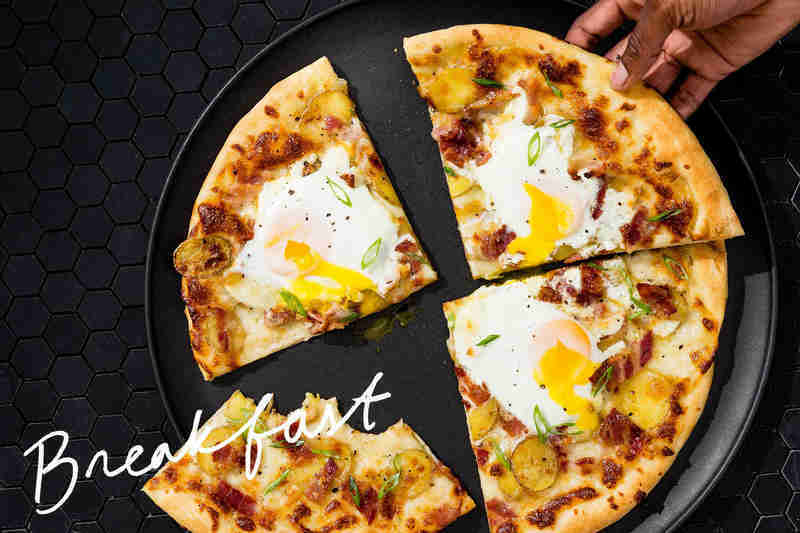 The breakfast pizza itself is proof of the versatility that pizza has, as a vessel for different styles of cuisine -- and is a testament to how malleable our definition of pizza can be. "Pizza is a 'format-food,' meaning it doesn't need to have a set list of defined ingredients. If you look at breakfast pizza, it's a perfect example," said Scott Weiner, pizza expert and founder of Scott's Pizza Tours. "People continue to take the format, and add food that everyone loves on top of it. People obviously love bacon, eggs, and breakfast food; it's no surprise people have taken to breakfast pizza." Where to get it: NYC's Speedy Romeo has made its name with creative takes on classic recipes. Their breakfast pie, the Ritz, features Taylor Ham (aka pork roll), egg, and cheese. It's basically a breakfast sandwich on a pizza. In LA, Milo + Olive use their specialty turquoise pizza ovens to create a signature breakfast pie with thick-cut potatoes, fresh farm eggs, and crumbled sausage that ensures LA isn't lacking a quality, AM-centric pie. Based in Chicago's Wrigleyville, Dimo's Pizza puts chicken and waffles on a pizza, pretty much proving Weiner's point. Pizza is a format, designed to be played with. Just like breakfast, actually. What it is: Generally wood-fired and often single-serving, California-style pizza is often compared to Neapolitan. But like the rad new kid from Malibu who shakes things up at a stuffy new school in a classic movie, it doesn't play by the rules. “When you say California pizza, it has nothing to do with the dough itself. California has to do with toppings," says Thomas McNaughton of San Francisco's Flour + Water. Basically, it's because of California that pizzerias now obsess over ultra-fresh ingredients and put things like broccoli and fennel on pies. Where it came from: In the Bay Area in 1980, chef Alice Waters of Chez Panisse and Ed LaDou of Prego began experimenting with the idea of California cuisine in pizza form, but when LaDou unknowingly served a pie with mustard, peppers, and pate to Wolfgang Puck, he was enlisted as pizza chef at Spago, where a smoked salmon pizza became symbolic of pizza as haute cuisine. Three years later, LaDou was enlisted to design a menu for California Pizza Kitchen, which became the national ambassador for California pizza and first choice for Midwestern homecoming dates thanks to offerings like Thai chicken pizza and its game-changing BBQ chicken pie. Nowadays, the term "California pizza" is slightly out of use. Places with fresh, inventive local ingredients now have a new name: pizza. Where to get it: Wolfgang Puck might have expanded his empire to airports and the soup aisle of Kroger, but Spago is still synonymous with opulent fine dining in Beverly Hills, with the smoked salmon pizza still front and center. 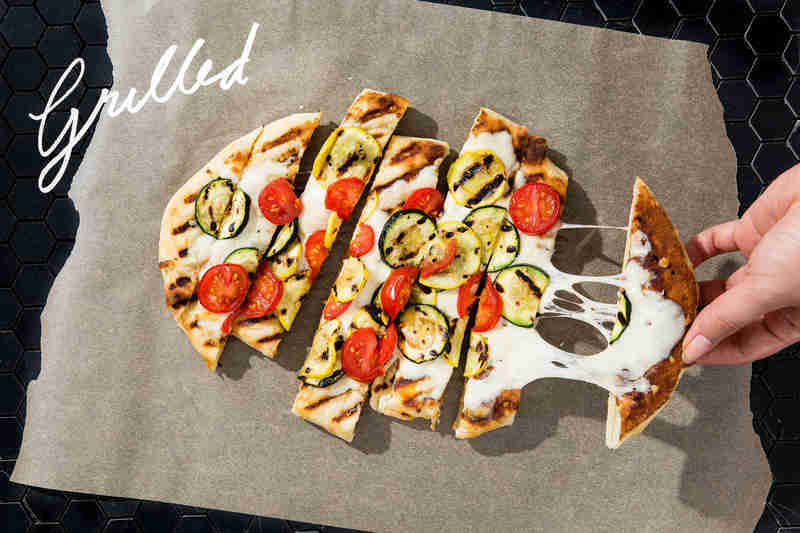 LaDou's California Pizza Kitchen original creations can now be had in more than 250 locations (and variations are available in grocery stores), with an ever-expanding roster of pies that now includes cauliflower crust options. McNaughton's beloved Flour + Water does wonderful unorthodox things with pasta, too, but the pizzas -- especially when the bone marrow psso shows up -- are works of creative art. What it is: It's Domino's. It's Pizza Hut. It's Papa Johns. It's Little Caesars. Essentially, it's "fast food pizza." You might recognize it specifically by its chewy, consistently cooked crust (more on that, below), and standard-tasting cheese and sauce, relative to more colorful local, "real" pizzerias, at least. Look. It is what it is. But you simply cannot deny chain pizza's overwhelming popularity in America. And frankly, sometimes it does hit the spot. It's OK. We won't tell anyone how much you secretly love it. Where it came from: In 1958, brothers Dan and Frank Carney asked their mother to borrow $600. With it, they founded their own pizza-based restaurant in Wichita, Kansas -- sending that the growing popularity of the Italian dish would only increase in the '60s. They named it Pizza Hut, after the modest trappings of their newly purchased, red brick building. 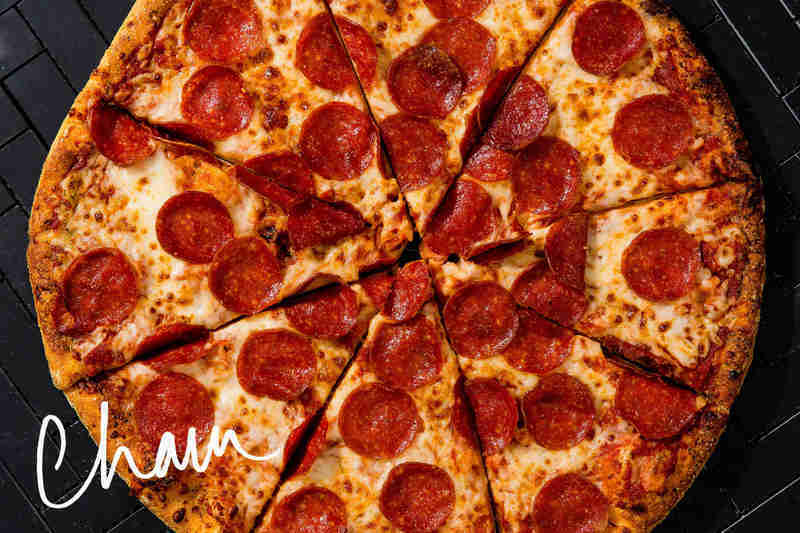 Sixty years and nearly 14,000 global locations later, Pizza Hut is (well, obviously) still very much alive -- as are other chains like Domino's (founded in 1959) and Papa John's (1984) that have followed in its wake. And there's a reason why all these chain pizzas seem to have some commonalities. "The pizza these chains make are consistent across the board, and most importantly, there is always minimal difference between the outer crust and inner crumb of the pizza. This all goes back to their shared use of conveyor belt air impingement ovens," said Scott Weiner, pizza expert and founder of Scott's Pizza Tours. "Their pizza doesn't actually bake on a hot surface, it bakes by being passed through hot air. That baking style is what gives all of their brands a similar consistency." That's the "chain pizza" taste you probably recognize, but could never adequately define. Where to get it: Umm... just about anywhere in the world? In fact, now, you can even order Domino's in the great outdoors. The original chain pizzeria, Pizza Hut is still going strong, stuffing crusts, and providing pizza-starved towns across the country with at least one option. And if you order Papa John's, don't forget to enjoy the pepper. What it is: A massive pizza with a honey-kissed, doughy crust loaded with so many toppings they have to create a folded-over containment wall around the crust just to keep it all in. Oh, and at founding pizzeria Beau Jo’s, it’s sold by the pound. Where it came from: “I like to do things a little differently, so we started doing the roll on the crust, which worked well because my feeling of putting more stuff on,” says Chip Bair, who founded Beau Jo’s in Idaho Springs, Colorado in 1973, where it remains relatively singular as the purveyor of the style. "I’m a little guy, but I could always eat a whole lot. 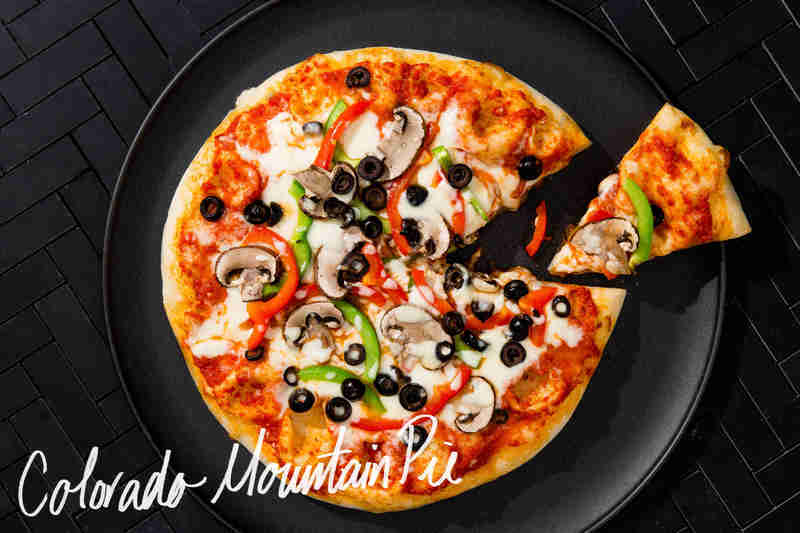 So we just started building them up, and it became the mountain pie to take care of mountain-type appetites.” Beau Jo’s has now expanded to six locations and spawned a Colorado obsession with massive pies. Just don’t call them “Colorado Style”: Beau Jo’s trademarked the term. Where to get it: Beau Jo’s is actually the only place to truly get the Colorado Mountain Pie, and Beau Jo's has the trademark to prove it. Luckily with six Rocky Mountain locations, getting a bite is easier now than ever. In Portland, Oregon, the Blind Onion doesn't precisely serve a Mountain-like pie, but this hippie-dippie Portland joint has mastered the art of the folded crust, and that's gotta count for something. What it is: It makes perfect sense that Chicago would be the birthplace for the heartiest of all pizza styles, baked in a high-sided pan to facilitate the formation of a crust that will contain a truly staggering payload of cheese and toppings, with the sauce and any finishing touches like spices or parmesan scattered on top. A subspecies known as "stuffed" pizza incorporates an additional, very thin layer of dough just below the sauce. 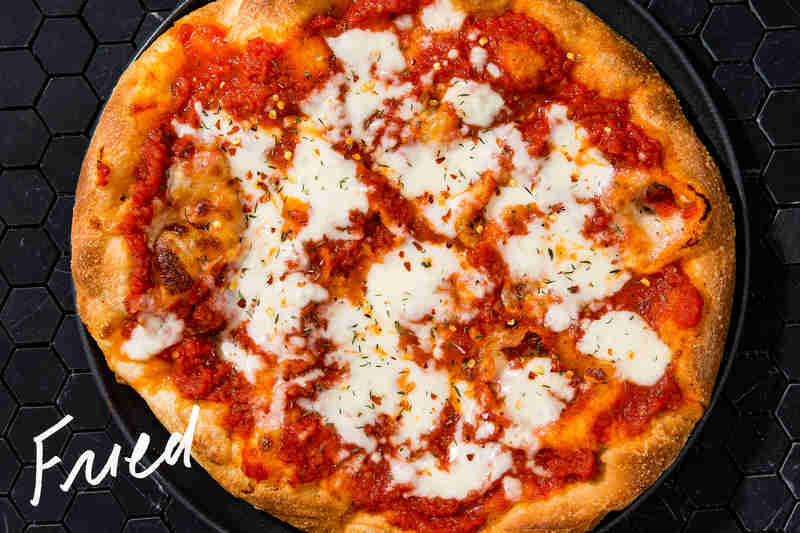 Where it came from: Before it became a national chain, Pizzeria Uno is generally credited as the godfather of deep-dish, though Rudy Malnati, a chef at Uno's who went on to spawn a pizza empire of his own (more on that later) also claimed to have had a hand in the recipe. 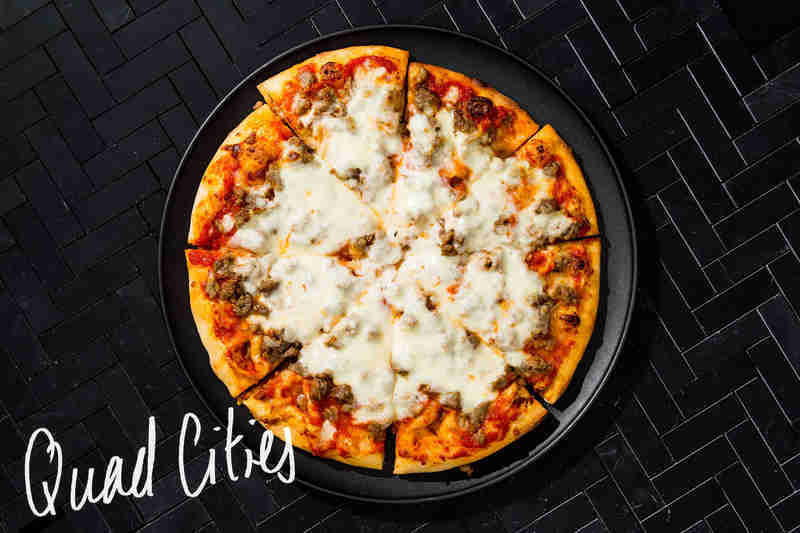 “The vision was to create a meal -- not just a pizza with a little bit of toppings and some cheese,” said Skip Weldon, chief marketing officer for Uno Restaurants. Anyone who has ever experienced a deep-dish food coma or survived a three-day blizzard with the leftovers from a single pie can attest that they fully delivered on their meal-making intent. Where to get it: Chicago is deep with deep-dish joints, but Lou Malnati's, now run by the aforementioned Rudy's descendants, has a buttery-crusted pie that many Chicagoans consider to be the purest expression of what deep-dish ought to taste like. For something a little different, Pequod's caramelized edge has earned it a legion of followers. Not too far from Wrigley Field you'll find The Art of Pizza, which offers a hearty, picture-perfect take on the stuffed subspecies of Chicago-style deep-dish. What it is: It's rectangular rather than round, with caramelized Wisconsin brick cheese giving the edged a crunch (no shredding here) that gives to a surprisingly fluffy, thick crust. That brick cheese goes down first, then the sauce tops it off. 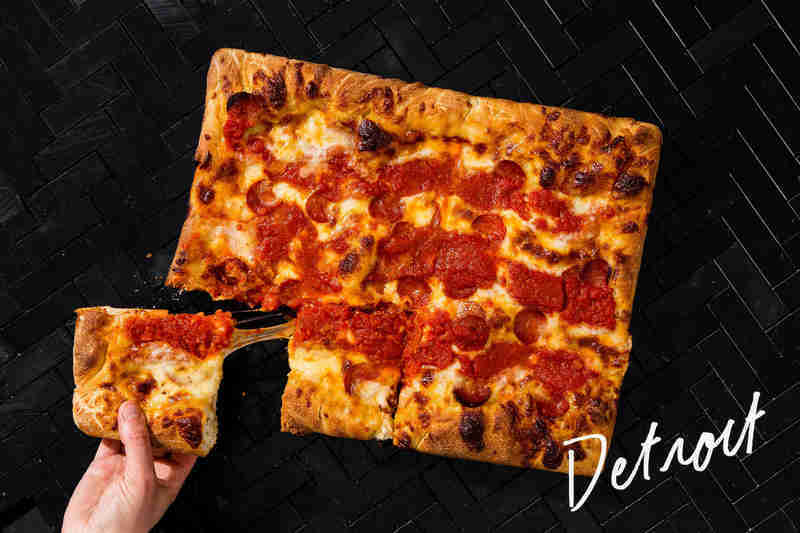 If you haven’t noticed, it’s having a moment, with pizzerias all over the nation adopting it, and big brands like DiGiorno and Detroit-based Little Caesars bringing it to the mainstream. Where to get it: Any pizza pilgrim owes it to themselves to sit down at a Buddy’s Pizza in the D and get a taste of what everybody else is emulating these days. Early adopters Via 313 -- who moved from Detroit to Austin long before the current exodus of Austinites to Detroit -- have taken over the Austin scene with pure Motor City authenticity. At Emily and Matt Hyland's Emmy Squared in Brooklyn, New York now has a destination for a taste of Detroit, which, based on the crowds, it's quite receptive to. 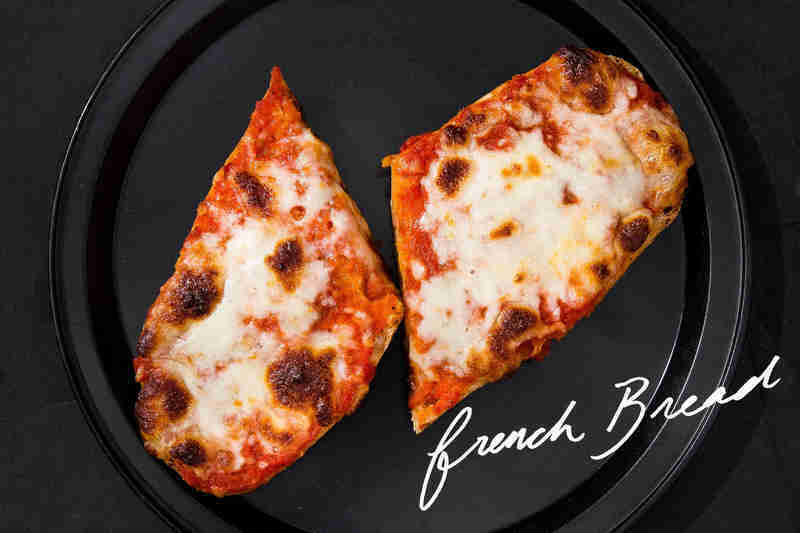 What it is: A classic of latchkey kids and college students, it’s simply pizza toppings thrown on a split baguette, then tossed in the oven until it's bubbly and extra crispy. Just don’t call it garlic bread with sauce. Where it came from: At this point, French bread pizza is mostly associated with the frozen Stouffer’s version, but the origin of the species dates back to 1960s, when legendary pizza entrepreneur Bob Petrillose debuted the Poor Man’s Pizza on the Cornell campus of Ithaca, New York. The Hot Truck became a fixture of the campus, with Bob manning the late-night shift for over 40 years, and even licensing his innovation to Stouffer’s. Petrillose died in 2008 and left behind a legacy of blurry memories for generations of students. “The Cornell students trusted him as a confidant, and he would listen as they chatted about their personal lives, commenting, joking, and offering advice -- all while a crowd of customers patiently waited outside,” his obituary reads. That legacy lives on: The Hot Truck is still a fixture on campus. Where to get it: For folks who want the genuine Hot Truck experience, minus the long lines of loaded college kids, Ithica's Shortstop Deli has been popping out Hot Truck's Poor Man's Pizzas in the deli 24/7 ever since Petrillose retired in 2000. Or, you know, join the legions of college kids late night as they shamble in line at the original The Hot Truck, which still trawls the campus of Cornell. Though they specialize in hot dogs, burgers, and cheesesteaks, Vegas joint Pop N Sons has also been known to do wonderful, pizzafied things with a split baguette. What it is: The name might lead you to believe that a pie is battered and then deep-fried like something straight out of the Texas State Fair. But fried pizza is much nuanced, and dare we say, delicate, than that. There are two main styles: a pizza fritte, which is essentially a fried calzone, and the much more complex montanara, in which dough is first flash-fried before being topped with sauce and cheese, and baked at super-high heat to finish. The result is a pizza that is not oily, but instead one that rests on a pillowy crust. Where it came from: Both styles originate in Naples, which is also home to arguably the most famous style of pizza today: Neapolitan. The fried versions have been sold by shops in Naples for many decades and some even claim that until the 1950s, fried pizza was actually more popular in the Italian city than the baked version. Unsurprisingly, the style has become a popular option in the United States. Where to get it: In a city filled with pizza places, New York's Don Antonio by Starita was legendary from the moment it opened. The restaurant serves both pizze fritte and montanara pizzas, but it’s known for the latter. In St. Paul, Minnesota, you'll find Mucci's Italian, whose montanara pies come topped with everything from fried chicken and garlic butter to black truffles and pine nuts. If you're overseas, Pizzeria Di Matteo is an institution in Naples, Italy that opened in 1936 and proclaims that it is both a pizzeria and a friggitoria, or fried food authority. So it would make sense that they make a stellar fried pizza -- a style that still accounts for a third of its sales today. What it is: Most prevalent in New England and the Midwest -- thanks to the massive influx of Greek immigrants who opened diners and pizzerias in the areas -- it’s a pan-style pizza with soft, doughy crust and a bit of crispiness on the bottom. Where it started: While the Greeks have been putting oil, cheese, and toppings on pizza since ancient times, it was the prevalence of Greek-owned restaurants in the Eastern US that really defined the style, which helped define the “pizzeria” version you see among many chains. “A lot of the early pizzerias in the Northeast, especially in Connecticut, New Jersey, and New York -- what was known as the Pizza Belt -- were run by Greek Americans," says Dr. Carol Helstosky, author of Pizza: A Global History. “You [could] open up a pizza [shop] with very low overhead. It’s not super time intensive, and it doesn’t need a lot of labor. So pizzerias became very attractive to immigrant entrepreneurs. Greek pizza didn’t take off in Texas, because there weren’t a lot of Greek immigrants.” And while most Greek pizzerias stick to “traditional” Americanized toppings like pepperoni, many also throw gyro meat and a side of spanakopita into the mix. Where to get it: With its gigantic slices served late night, gyro meat and tzatziki sauce on pies, grinders and gyros on offer and baklava for dessert, Georgio's Pizza in East Lansing, Michigan is the kind of place that exists in every Big Ten town. Only better. Two Greek-American immigrant traditions -- the 24-hour diner and the pizzeria -- together under one gigantic roof at New York's Mamaroneck Diner. In Greenfield, Massachusetts, Village Pizza is a classic, a brick-laden Greek pizzeria in a small town that shells out picture-perfect red tablecloth Greek pies, plus an array of scrappier offerings like chicken cordon bleu pizza and a chicken and broccoli number that must have spun heads before the California pizza boom. What it is: Grilled pizza is one of the rare styles of pie where the pizza itself never needs to be placed inside an oven. This non-traditional method of pizza making involves brushing the crust with heavy coats of oil before placing it on a grate over hot coals. 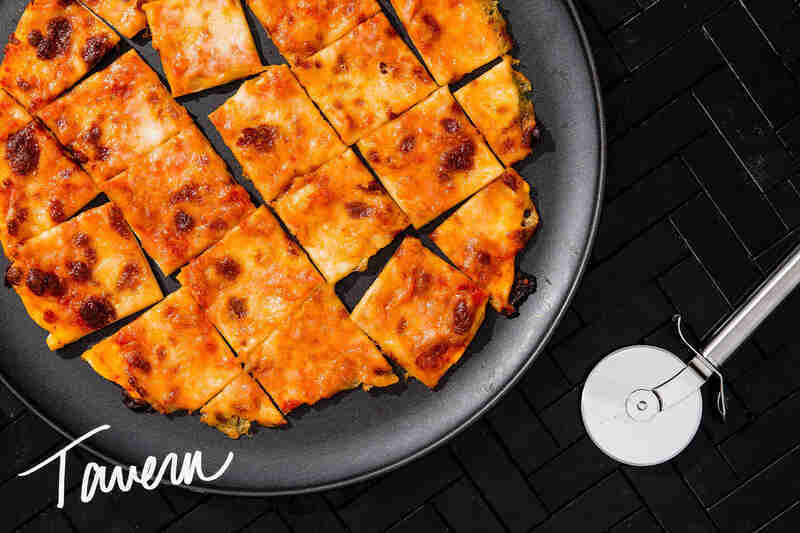 The dough will take several turns (ideally charring parts of it) before toppings -- your standard cheeses, meats, and veggies -- are added after the last flip, and given time to melt into each other and the crust in classic pizza fashion. It's super-crunchy, kind of oily, sometimes quite charred, but most importantly, it makes you wonder if ovens are truly necessary to make a great pizza. In this case, the answer is a hard "no." Where it came from: The story of grilled pizza as we know it begins (and continues!) in Providence, Rhode Island, at Al Forno -- a pizza shop that has turned a mistake into a bona fide regional icon. Owners Johanne Killeen and George Germon were trying to recreate the taste of wood-fired pizza in their own kitchen (that didn't have a wood fired oven, obviously). They realized that so much of what they loved about this style of pizza was the crunchy, smoky taste that the fire gave the crust -- and this could easily be recreated via traditional, open-air grilling. Though the logistics seemed hairy, the end result was anything but. "I think the concept of grilling pizza might scare a lot of people away," said Laura Meyer, an instructor at the International School of Pizza, and head chef/pizzaiola at Tony's Pizza Napoletana in San Francisco. "But I think what they found out was that the dough hardens almost immediately, it doesn't fall through or break apart. And what you get is this really hard, charred, smoky feel that makes it really distinct, and something totally different than what you get with an oven. 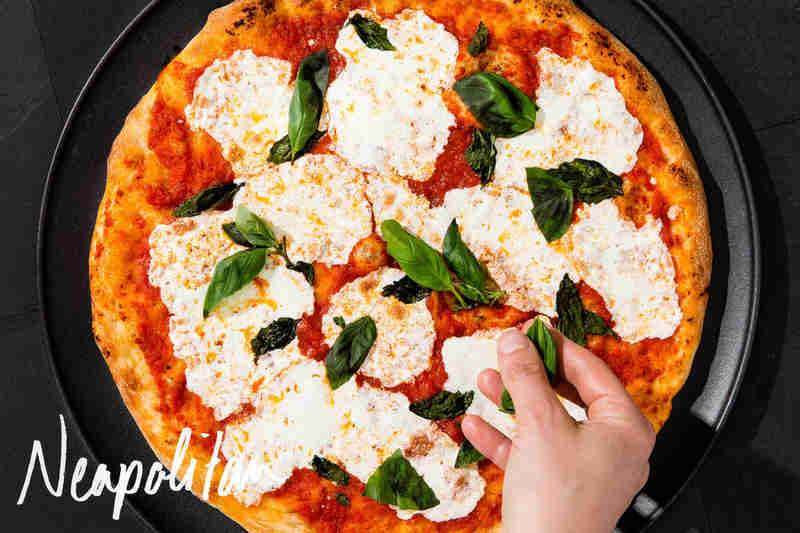 It's really unique, and in my opinion, a really cool way to experiment with traditional pizza making." Where to get it: While Al Forno's remains the inventors gold standard of the style, their Providence counterpart Timmy's Legendary Grilled Pizza is indeed legendary, and a nice alternative to Al Forno's -- if you are looking for one. Despite the "gourmet" affectation, The Pizza Gourmet is a little more low-key than Timmy's or Al Forno, but their grilled pizza is worth a stop on the "Providence grilled pizza tour" you are undoubtedly planning right now. What it is: While it might sound like it, “Indian Pizza” is not a euphemism for cheese-and-sauce-stuffed naan. Nor is it even a pizza necessarily made on a naan crust (though it can be). Indian Pizza simply denotes a pizza crust that swaps standard toppings like pepperoni and barbecue chicken for flavor-packed Indian food favorites like saag paneer and tandoori chicken, as well as popular ingredients used in Indian cuisine like fenugreek and chutney. These ingredients are layered on, usually with plenty of cheese, and baked off like a standard pie. Options range from mom-and-pop versions that stick to a simple formula to chaffy-takes that experiment with crust types and topping combinations. Where it came from: There is a general agreement that Indian Pizza — found most commonly in the United States and now in the UK — was first created at Zante’s in San Francisco. 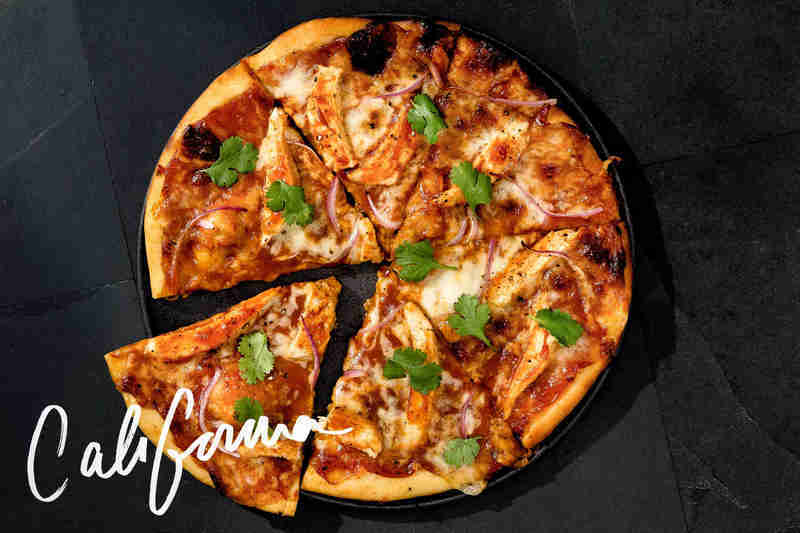 When owner Dalvinder Multani first moved to the United States from India, he spent four years making pizzas in New York City. When he moved out West and opened Zante’s he sold both pizzas alongside an array of classic North Indian dishes like tandoor chicken. After customers suggested that Multani combine the two into one magical dish, the Indian pizza was born. Where to get it: Largely considered to be the OG Indian Pizza joint, San Francisco institution Zante's has been turning out fusion pies since 1986 and is still going strong. 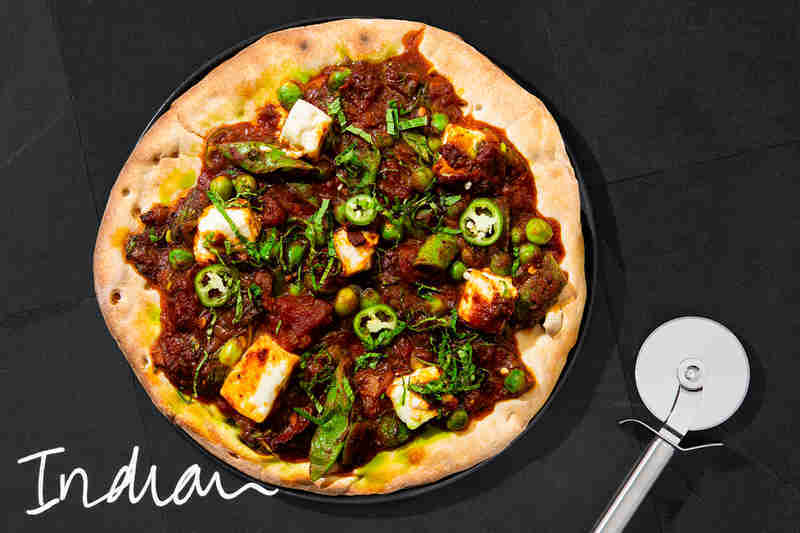 Further from the coast, Curry on Crust is located a short drive from the Detroit airport, this “Desi” pizzeria serves up a large menu of pizzas all topped with house-made Indian dishes like paneer tikka masala and aloo gobi (spiced cauliflower and potatoes). What it is: In an era when traditional slices don't always meet our "more everything!" needs, the jumbo slice is there to quite literally fulfill even the most jaded by-the-slice consumer. 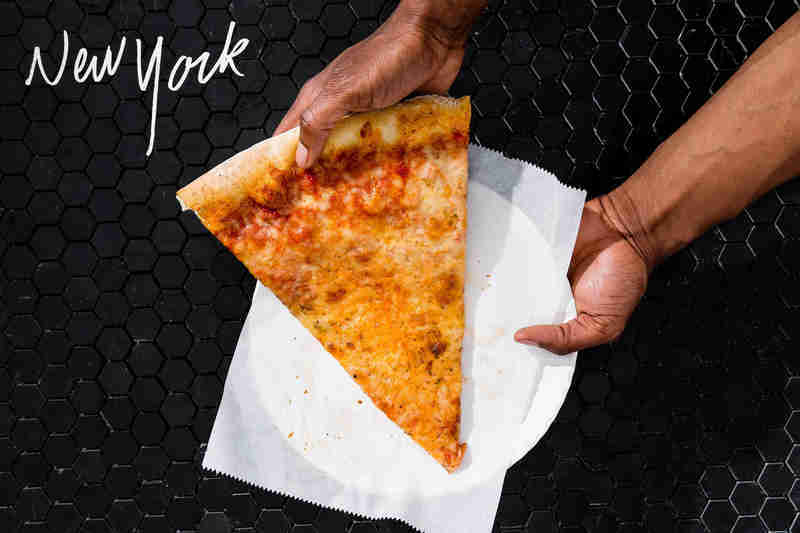 This behemoth of a slice -- while certainly significantly larger than what you’d find in a classic slice shop -- is simply New York-style pizza, just done bigger. 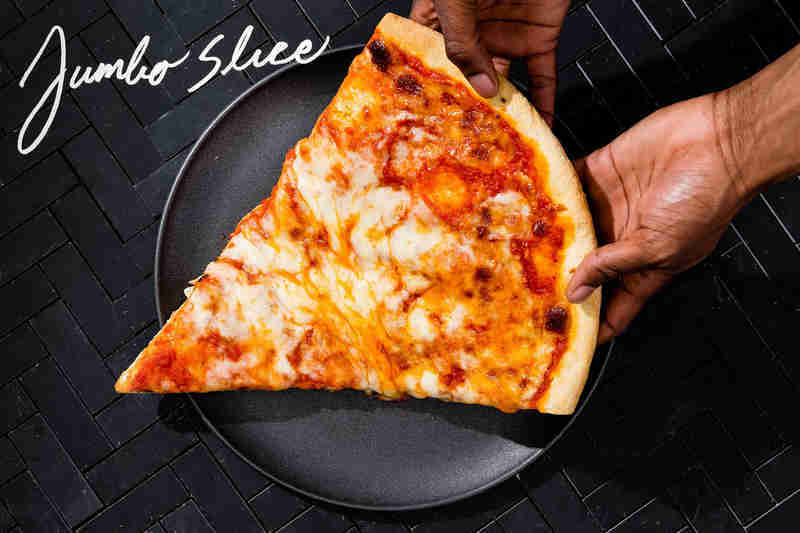 Where to get it: It comes as no surprise that there are plenty of places in DC slinging the extra-large slice, many under similar names like Jumbo Slice or Jumbo Pizza. The slice, served on no fewer than three white paper plates -- or in its own personal pizza box -- may be blistered and prone to bubbles, but has a certain undeniable charm in the early hours of the morning. Perched intentionally close to Columbia University, Koronet Pizza has been doling out super-sized slices to college students and Morningside Heights locals since 1981. The slices here end up equalling about three-and-a-half “normal” slices and are often split down the middle to be shared among two. In Northampton, Massachusetts, Mimmo's Pizza is a small shop with modest digs known for its immodestly ginormous slices. What it is: Also known as Turkish pizza or Armenian pizza, lahmajoun is... well, not exactly pizza. 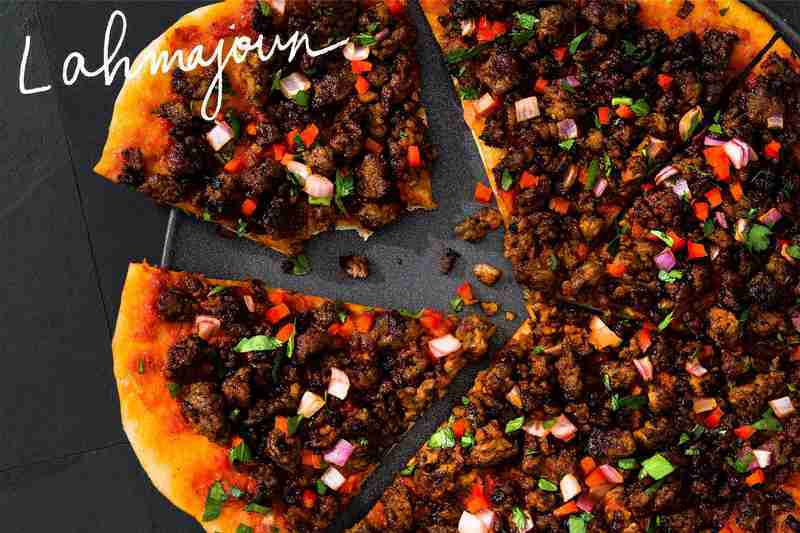 It’s an extremely thin, round flatbread layered with ground beef or lamb, minced vegetables, and a bouquet of spices that's been re-branded "pizza." Where it came from: Lahmajoun has been served for centuries in the Middle East, though exactly when (or where) it truly originated remains a topic of debate. Once considered a “food of the elite,” it’s become more and more popular in the US over the course of the last few decades, when Middle Eastern food became more popular outside the immigrant community. As to why it’s been called “pizza?” That’s anyone’s guess, too, though it’s generally believed to be more about marketing to American palates, which seems to be working. “The only thing that’s similar to pizza is its shape and that it’s layered on top. Otherwise, I don’t know why they ever called it a pizza. It’s got nothing to do with pizza,” says Tina Yeretsian, speaking on behalf of her father David Yeretsian, who presides over LA’s rapidly expanding Sasoun Bakery. “It’s getting a lot of exposure outside of the Armenian and Middle Eastern community. Probably 75% of the customers at our Hollywood location are non-Armenian or Middle Eastern.” Call it what you want. It's still delicious. Where to get it: Rapidly expanding from its original location in Armenian hub Glendale, Sasoun Bakery is LA's premier ambassador for all things lahmajoun (and boereks, and maneishe…). Massis Bakery in Watertown, Massachusetts makes its lahmejune in four varieties -- beef, lamb, chicken, and veggie -- and is even able to ship them out along with other baked goods. Upscale metro Detroit restaurant The Farm Grill serves its lahmajoun alongside kebabs, shawarma, and a smorgasbord of other Middle Eastern favorites. What it is: It is, quite literally, the granddaddy of all pizza. This is pizza as it was originally intended. The dough is fermented anywhere from a couple hours to several days, and gives the pizza a soft, easy-to-chew mouthfeel, with a hint of oven-kissed crunch along the bottom, often with delicious dough bubbles lacing the crust. The tops of the pies are commonly peppered with fresh tomatoes, herbs, and other veggies, with a thin layer of red sauce, and a relatively sparse application of cheese (the iconic margherita being the most popular preparation). Cooked inside wood-fired ovens, this is as "traditional" as pizza can get. In fact, the Associazione Verace Pizza Napoletana (AVPN) offers strict regulations any "true" Neapolitan pizza must follow, governing everything from the size to the flour to the type of salt, though many fine pizzerias offer Neapolitan-inspired pies that don't necessarily adhere to every letter of these pizza laws. Where it came from: The history of Neapolitan pizza is the history of pizza itself. Flatbread had existed in Naples since the mid-Millenium, but never officially became "pizza" as we know it till tomatoes made their way from South America to Italy in the 16th century, where peasants, sailors, and tradesmen began putting them (with cheese eventually) on top of flatbread cooked inside wood-fired ovens. That's the (very) abbreviated history of pizza. And from there, every other riff and style on this list -- and in existence -- was born. "Compare it to an instrument. This is the piano of the pizza world: almost all music is based off the piano, and all pizza is based off the original Neapolitan. But in both cases, the originals still exist, and is still enjoyed," said Laura Meyer, an instructor at the International School of Pizza, and head chef/pizzaiola at Tony's Pizza Napoletana in San Francisco. "Immigrants who came to America brought this style with them when they became settling in the States, and all of our pizza here can be traced back to that. Without Neapolitan pizza, there would be no pizza. And that's really the most important thing to know here." Where to get it: New York and Atlanta residents can find faithfully executed Neapolitan pizzas at Ribalta. Chicago's premier Neapolitan pizza restaurant Spacca Napoli takes their pies very seriously, and the results are seriously impressive. Tony's Pizza Napoletana makes sure every jaded New Yorker who claims "there's no good pizza in California" is forced to eat their words. What it is: New Haven pizza is instantly recognizable for a few reasons. First off, the extreme temperatures of the (mainly) wood give the crust a charred, toothsome hardness, and an often warped, knobby, asymmetrical appearance. The dough is generally left to ferment much longer than traditional pizzas, and the pies themselves are commonly topped with sparse hits of tomatoes, cheese, meats, and in many cases white sauce and clams (any New Haven pizza joint worth their salt will have this, by the way). This certainly isn't the most beautiful looking pizza. In fact, sometimes it can look downright goofy. But that hasn't stopped it from being one of the most storied pizza styles in the entire world, and one of the most beloved regional foods in America. Where it came from: You might hear New Haven pies referred to as "apizza" (pronounced “ah-beets”) up in New Haven, Connecticut (where they naturally originated). This isn't a semi-offense Italian accent attempt, but a callback to the Italian dialect spoken in Naples. It's this sense and embrace of tradition that has made New Haven-style such a mainstay in the pizza world. "At the beginning of the 20th century, New Haven became a popular spot, just outside of New York, for Italian immigrants to settle and lay down roots," said Scott Weiner, pizza historian and founder of Scott's Pizza Tours. "They embraced this style of pizza associated with their home country. But over the years the pies have gotten a little more aggressive. They've added some regional notes and components that has really made it something of completely new." While New Haven style doesn't necessarily mean white clams, this style that the iconic Frank Pepe's invented (Frank Pepe's is also credited with being the first pizza restaurant in New Haven) has become synonymous with New Haven pizza, and a prime example of how it can stick to its roots, with a little bit of that aforementioned "aggression" added in. Where to get it: If you want a White Clam New Haven-style pizza, you really don't want to go anywhere but Frank Pepe's to sample this truly game-changing dish. Sally's Apizza is right there with Pepe's on the list of iconic, New Haven-style pizza joints. And some people even prefer it, but that's a debate for another day. For New Haven-style pizza outside of Connecticut, you'd have a hard time finding a better spot than Piece Brewery and Pizzeria in Chicago, where the quality of the beer mitigates the likely wait for a table. What it is: Simply put: This is pizza. When you conjure an image of the Platonic ideal of what a pizza should be, you're probably visualizing a box of full of New York slices. Hand-tossed, round pies with a thin(ish), crispy crust (like its Neapolitan predecessor), featuring a light layer of heavily seasoned tomato sauce, topped with gooey, "pull-able" mozzarella cheese, and commonly served via solo slice and topped with pepperoni: This is pizza as you know it. Where it came from: While New York City (obviously) can't claim to be the birthplace of pizza in general, it certainly can claim to be the birthplace of "American" pizza. The Italian immigrants who founded Lombardi's, the first known pizzeria in the United States, have been serving Neapolitan-style pies in Little Italy since 1905. But from there, as Italio-American influence grew (and everyone else discovered how delicious their cuisine can be), pizza shops following Lombardi's lead began springing up, and catering to urban dwellers on the go -- and on a budget. By the mid 20th century, no-frills slice shops like Ray's Pizza (opened by Ralph Cuomo in 1959) became NYC mainstays, featuring simplified Neapolitan-influenced pies designed to be cut into individual slices. The rest is, quite literally, history. There's a New York-style pizza shop in almost every town in America. "The New York slice is pizza as we know it, and is largely responsible for how popular pizza is in America today," said Scott Weiner, pizza expert and founder of Scott's Pizza Tours. "It's portable. It's shareable. It's what most people think about when they think about pizza. It's just that simple." Where to get it: In lieu of trying to find which Famous Ray's is actually famous, visit Greenwich Village staple Joe's Pizza (open since 1975) to get a taste of old-school New York via a piping hot slice. This longtime Brooklyn culinary landmark Di Fara is regarded by many to serve the "best" pizza in New York City -- which would, of course, put it on the shortlist for best in the entire world. Anthony Bourdain, for one, was a mega-fan. At the other end of the spectrum, just get a buck and grab a slice at literally any dollar slice joint -- best enjoyed at 3am after a bar crawl. It won't be the best you've ever had, but it's nonetheless a true New York pizza experience. What it is: Oh boy. 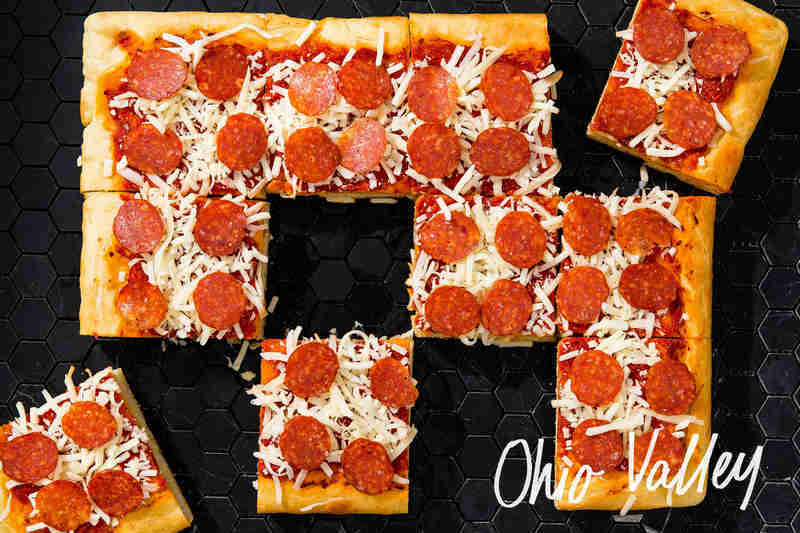 Perhaps the oddest entry on this list, Ohio Valley style -- depending on your opinion -- is either the dark hose, regional hero of the pizza world, or a tomato sauce-laden abomination. You have thin crust, square-cut pizzas that are topped with cheese and pepperoni… but only after they leave the oven. So yes, the grated mozzarella and meats are served cold. The thought is that the heat from the pizza will slightly melt the (still-cold) lumps of cheese. Spoiler alert: It often doesn't. But the hot-cold sensation from the uncooked cheese is truly unlike anything else on this list. To be honest, it kind of gives off Lunchables vibes. And that isn't always a bad thing. Where it came from: Naturally, it came from the Ohio Valley (unofficially: Ohio, Pennsylvania, West Virginia, Kentucky, parts of Illinois, and Indiana). But specifically, the style was defined, popularized, and serialized by DiCarlo's: an Ohio-based regional chain that started off as a bakery that dipped into the pizza game with their idiosyncratic recipe after the owner's son returned from Italy after serving in World War II. He brought back many tales of the joys of pizza, and the family made it their primary focus. As far as the joy of Ohio Valley pizza, in particular: "The hot-cold dynamic definitely makes it different than any other style," said Laura Meyer, an instructor at the International School of Pizza, and head chef/pizzaiola at Tony's Pizza Napoletana in San Francisco. "It plays with the contrast. It screws with your mind. It kind of challenges your idea of what pizza can be. But is that a bad thing? I don't think so. It might not be your preferred style, but you have to appreciate it for what it is." Where to get it: If you can only experience Ohio Valley pizza at one spot, DiCarlo's is the place. Cold pepperoni included. Located in the western region of the Ohio Valley (Pittsburgh, specifically), Beto's plays with the format a little bit, using circular pies, thicker crust pies cut into triangular pieces -- but still keeps the hot sauce/cold cheese and toppings template. If you don't want DiCarlo's (for some reason) Wheeling, Ohio's decidedly divey Giannamore's Pizza will you give their homemade variation of the regional classic. This time, with more (still cold) cheese. What it is: If you haven't been to Northeastern Pennsylvania (otherwise known as NEPA), there's a solid chance you've never seen or heard about Old Forge pizza. It basically looks like a thick, Sicilian pie, inside a deep-dish tray (but NEVER call this a "pie," it is a tray. They will yell at you). The dough is generally a little lighter than traditional deep-dish, and it has a distinctly chewy center. There's two types of Old Forge pizza: red and white. Red includes a sweet red sauce (duh), thinly cut onions, and blends of cheeses that can include mozzarella, Cheddar, or even American. White is generally stuffed with dough on the bottom and top of the tray, with a ton of cheese, but zero sauce. If you couldn't already tell, Old Forge is definitely an outlier in the pizza world. Where it came from: Outside of Old Forge, Pennsylvania (in Lackawanna County), there's a sign that cheekily touts the town as the "Pizza Capital of the World." And their residents truly believe that. "It's really amazing how passionate the people who live in Old Forge are about their pizza," said Scott Weiner, pizza historian and founder of Scott's Pizza Tours. "It clearly came to that town with a group of people from Italy who were working in the coal mines. They were used to making and eating that style of focaccia, and then, this distinct regional style became the pizza in that town, it just never went away." Generally, (the now-closed) Ghigiarelli’s in Old Forge is believed to be the first place that began serving the trays commercially to coal miners looking for a familiar snack to pair with their beers after a long shift. 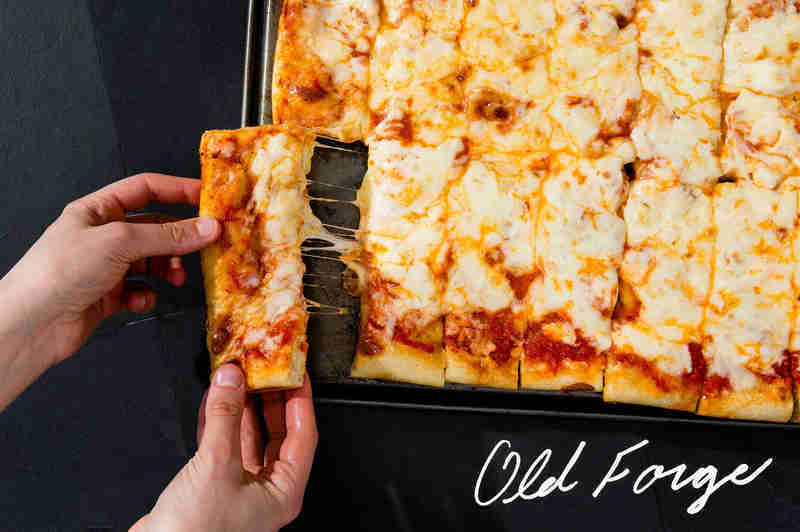 And while they closed years ago, a handful of worthy successors to the tray-based throne have emerged, to ensure Old Forge remains the "Pizza Capital of the World." In their minds, at least. Where to eat it: Mary Lou's is a decidedly no-frills pizza joint continues the tradition of old-school trays -- serving both white and red -- to residents of Old Forge. Be warned: sometimes, they close super early. So, get there super early. While more of a traditional Italian restaurant than a pizza shop, Arcaro & Genell's happens to serve one of the best trays in all of Old Forge. Less heralded than our previous two picks, Salerno's Cafe happens to offer a steak and cheese Old Forge tray, bringing a little bit of Philly style to Lackawanna's trademark pizza. What it is: Triangles? Quad Cities pizza don’t need your triangles: These round pies are cut into strips -- think Pokey Stix, if you went to a Big Ten school -- using scissors. 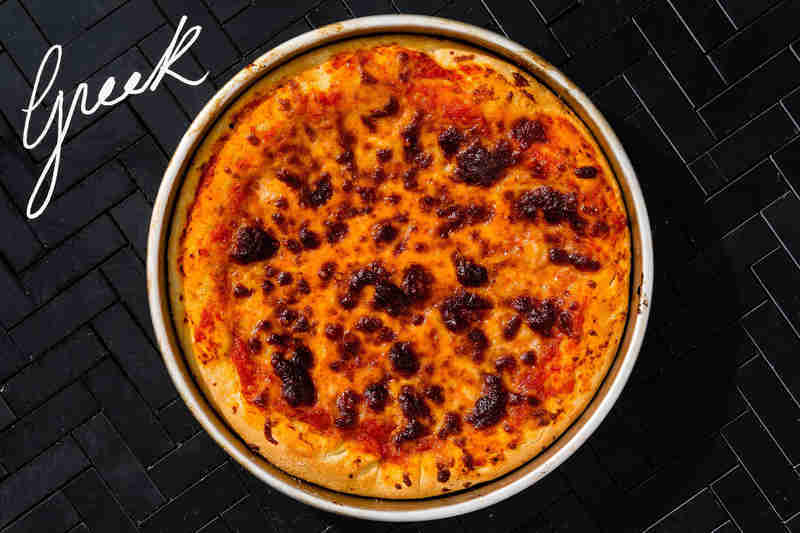 It’s also got a malt-heavy crust that gives it a nutty quality, a spicy sauce, and toppings hidden under an extremely thick layer of cheese. Where it came from: There are actually five cities in the Quad Cities, which sit at the intersection of Northwest Illinois and Southeast Iowa. As with many Midwestern cuisines, two different restaurants claim to have invented the area's unique pizza: Frank’s and Harris. As those restaurants’ employees branched out across the region, they brought with them the style. 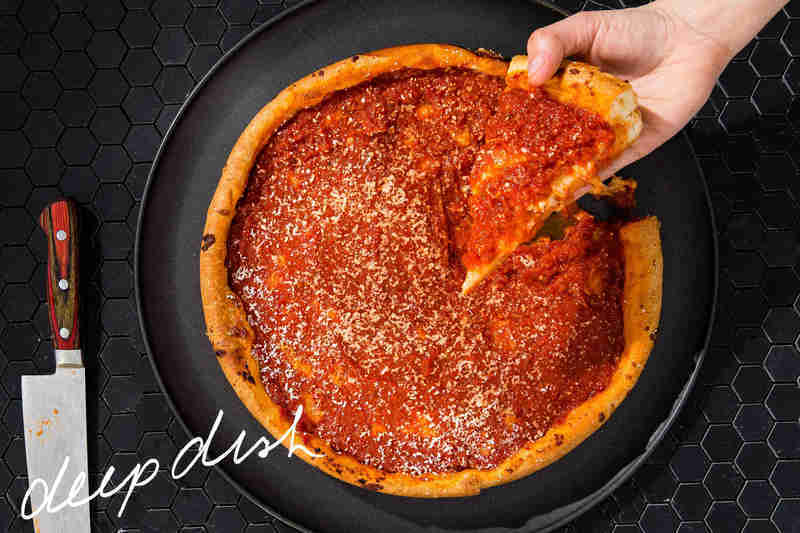 Now it's taking over Chicago thanks to Roots Pizza, whose founder, Greg Mohr, braved the land of deep-dish to unleash pizza inspired by Harris Pizza, which consulted on the recipe. “Nobody in the Quad Cities was like ‘this is Quad Cities pizza.’ It’s just pizza,” More says. "But when I moved to Chicago, I noticed that I couldn’t find this style of pizza, so I started thinking maybe it would be cool to bring it here. People really yearn for this pizza that they grew up on.” It worked: Mohr's restaurants continue to grow, and so too does knowledge of the secret that the Quad Cities have been keeping all this time. Where to get it: Harris Pizza is a Rock Island institution has defined "pizza" for generations of Quad Cities eaters, who likely left their childhood homes only to become confused about triangular slices. Not content to simply own Davenport's Quad Cities style, Uncle Bill’s also does wonderful things with BBQ chicken, fajita, and taco pizzas. As mentioned, Roots Handmade Pizza in Chicago is one of the only ambassadors to take the style out of the Quad Cities, Mohr built his Chicago pizza empire on his own nostalgia. The masses followed. What it is: To be sure, there is LOTS of pizza in Rome, but in America referring to "Roman-style" pizza generally means pizza al taglio, which consists of rectangular trays of a light, airy crust that offers an almost bread-like interior. The topping schemes can lean extremely simple, such as a sparse layer of tomato sauce (rossa) or mere olive oil and sea salt (bianca), but establishments often branch out into a variety of accoutrements from thinly sliced potatoes and rosemary to zucchini to prosciutto. These trays will line the counter side-by-side as customers indicate their selections and gesture with their hands to indicate how big a piece, which will be weighed to determine the price. Where to get it: Iezzi himself partnered with Fabio Casella of New York's San Matteo Pizzeria to open Pizza Quadrata Romana (PQR) on New York's Upper East Side. The other major heavyweight in the Roman pizza world, Gabriele Bonci, has also planted his flag stateside, having opened two locations of his eponymous Bonci in Chicago. In Los Angeles, you'll find James Beard winner Nancy Silverton behind the recently opened Triple Beam, and LA native (who spent childhood summers in Rome) Luigi Roditis helming the much-loved il Romanista. What it is: Perhaps the most divisive pizza in the US -- sushi pizza be damned -- St. Louis’ take on pizza is a cracker-thin, overloaded, square-sliced round pie not dissimilar in appearance to a tavern pie, but with a thinner crust and approximately a metric ton more oregano. Sounds normal. But the division comes into play in the form of Provel, a cultishly beloved processed blend of Cheddar, Swiss, and provolone that some liken to Velveeta in consistency. Purists call fowl. But fans are passionate that this is, in fact, one of the best acquired tastes in America. Where it came from: Provel was trademarked in 1947, but, according to a fascinating thin-crust deep-dive by Feast Magazine, it didn’t find its way onto a pizza until stalwart Luigi’s Restaurant tossed it on a pie back in 1953. Luca “Luigi” Meglio -- who also developed a conveyor belt pizza oven and became a frozen pizza magnate -- was the innovator, but it was Ed and Margie Imo who cemented the style in the city’s fabric in 1963, opening up Imo's, which would become a massive chain of St. Louis-style pizzerias that have basically become synonymous with the style. Now, you can get a proven-topped in pubs and pizzerias throughout the area. For the rest of the country, it remains an oddity. For folks in St. Louis, it’s pure comfort. 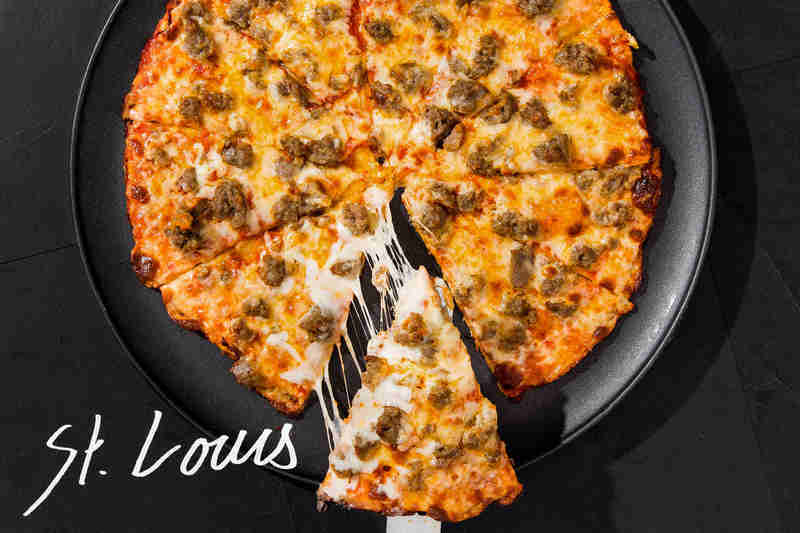 Where to get it: Imo’s is most popular and famous purveyor of the style, almost synonymous with St. Louis Pizza. And as a bonus, they'll even ship frozen pies to St. Louis expats (cough, Jon Hamm). Upscale St. Louis eatery Guido’s puts an emphasis on authentic Italian and Spanish fare, save for the pizza, which reps St. Louis in all its authentic Provel glory. DeRienzo’s built up a following over the years, and it ain't for clean living, either. Case in point, the glorious Big Joe's DeLuxe, loaded with sausage, hamburger, bacon, pepperoni, onion, peppers, mushrooms, and, yup, plenty of Provel. 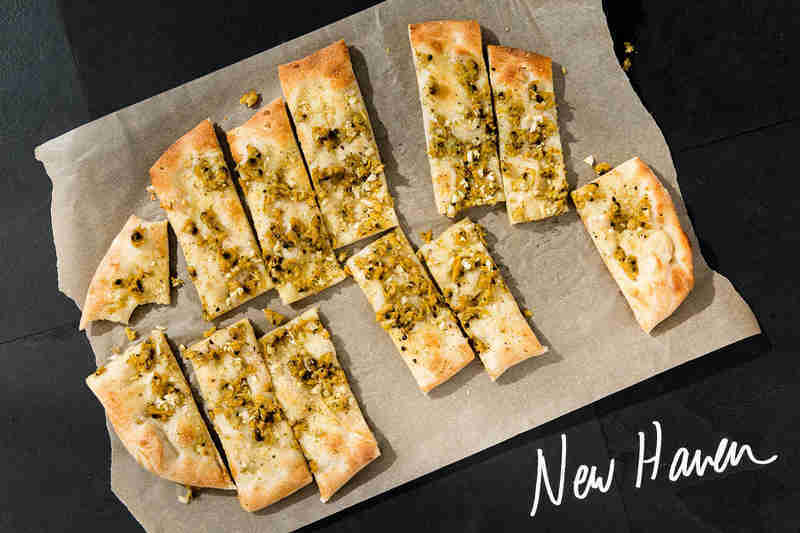 What it is: Thick, focaccia-like crust exhibiting a crunchier exterior and airy interior. It was originally served with just sauce and a dusting of cheese, though as it’s become more Americanized, cheese has been added pretty liberally. A thinner version than the thick Sicilian is often referred to as grandma, or nonna. Where it started: Sicily, naturally. 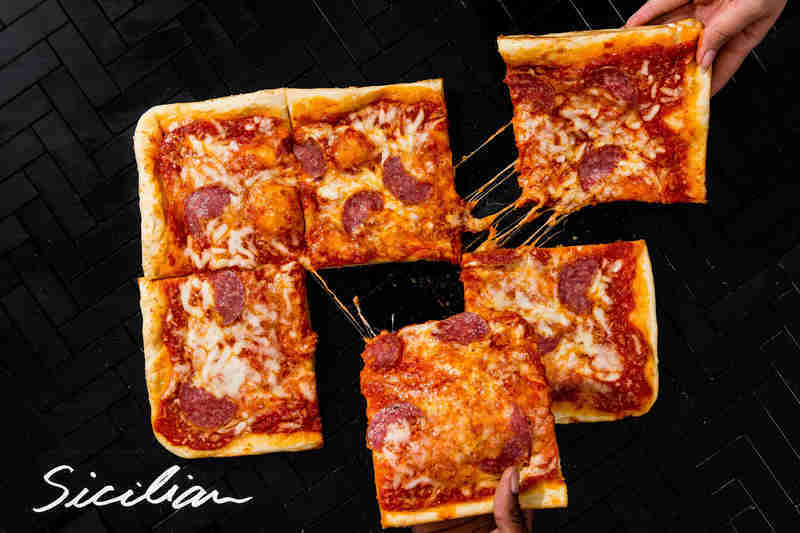 But what pizzerias in the US call Sicilian would be nigh unrecognizable in Italy: "What we call Sicilian pizza in America is actually called sfincione in Italy,” writes Liz Barrett in Pizza: A Slice of America. “When sfincione was first being sold in the States, it stayed fairly true to form, as it was topped simply with tomato sauce and a dusting of cheese... as years passed, however, more pizzerias started adding mozzarella to the recipe in order to appease American tastes.” So, essentially, the Sicilian pizza follows a similar arc to The Godfather: Its ancestors showed up in New York (Long Island, specifically), and as time passed they got thicker, cheesier, and more indulgent, to the point that you suspect it's trying to kill you. Where to get it: At L&B Spumoni Gardens in Brooklyn, you'll find a classic doughy Sicilian slice topped with lots of fresh mozzarella and a rich tomato sauce on top of that. It’s messy and delicious, best eaten outside on one of the red picnic tables. Galleria Umberto is thick, cheesy, and famous. Umberto closes the moment it sells the last slice. Get there early. Big Mario's in Seattle sells big, fat Sicilian slices with a 40 of Olde English, just like your nonna used to do. What it is: This is pizza, with a crust stuffed full of chewy, stretchy mozzarella cheese. It's that simple. Surely you've seen some slow motion commercials for Pizza Hut? It's not exactly complicated. Where it came from: In 1995, Pizza Hut introduced what very well may have been the first stunt pizza, by debuting a trademark pie featuring a crust stuffed to the limits with ooey mozzarella cheese (they even used a commercial featuring Donald and Ivanka Trump. Yes, seriously). When the pizza became the noteworthy munchie that still persists in our culinary, fast food lexicon, a slew of small-time pizza makers tried to lay claim to the stuffed crust, saying they did it first. Notably, pizza maker and Brooklyn native Anthony Mongiello claimed the concept of stuffed crust pizza was undeniably his, and even sued the Hut for a whopping 1 billion dollars. (The judge threw out the suit in 1999.) 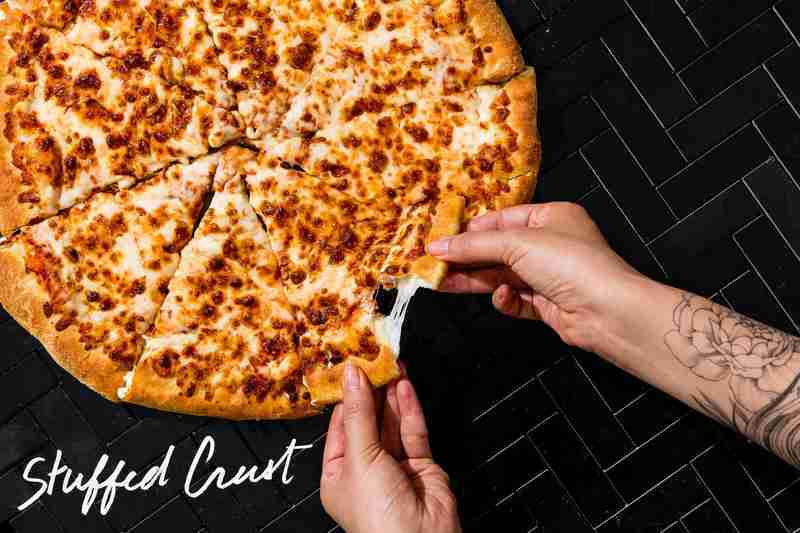 Whether you love it, hate it, or have claimed to invent it, you can't deny the draw stuffed crust pizza still has. 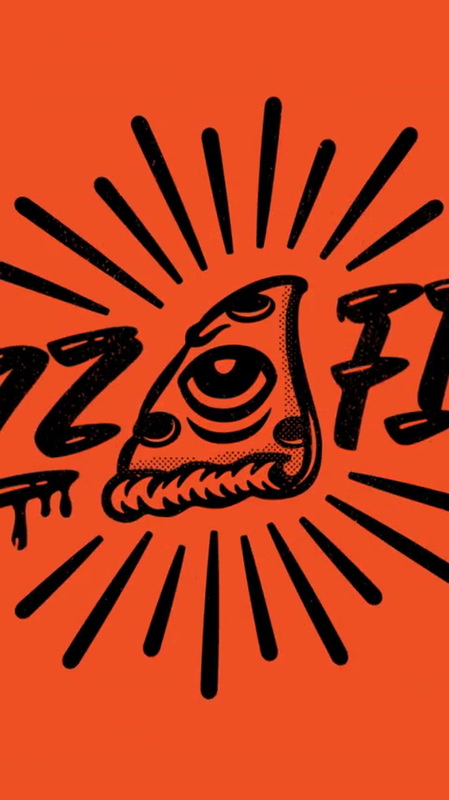 "Frankly it kind of makes me sick, and I see it all over TV, all the time" said Dan Bransfield, author of Pizzapedia: An Illustrated Guide to Pizza. "But it's definitely a cultural phenomenon that has been copied by pretty much every pizza chain in existence. You can't deny that people like it, or that it made an impact on how we view chain pizza today." Where to get it: Like, besides Pizza Hut? Little Caesars also does a version. Or, if you're looking for something a little less "corporate", idiosyncratic Portland pizza joint Scottie's Pizza Parlor does a small-time, independent riff on the Pizza Hut classic every Sunday. What it is: To paraphrase Potter Stewart, stunt pizza is very much an "I know it when I see it" situation in which a pizzeria is seeking to create not only fine flavors, but also that extra "wow" factor that moves the imagination and accumulates Instagram likes. Think driving the carb counters mad and topping a pizza crust with mac & cheese, or better yet, another slice of pizza. 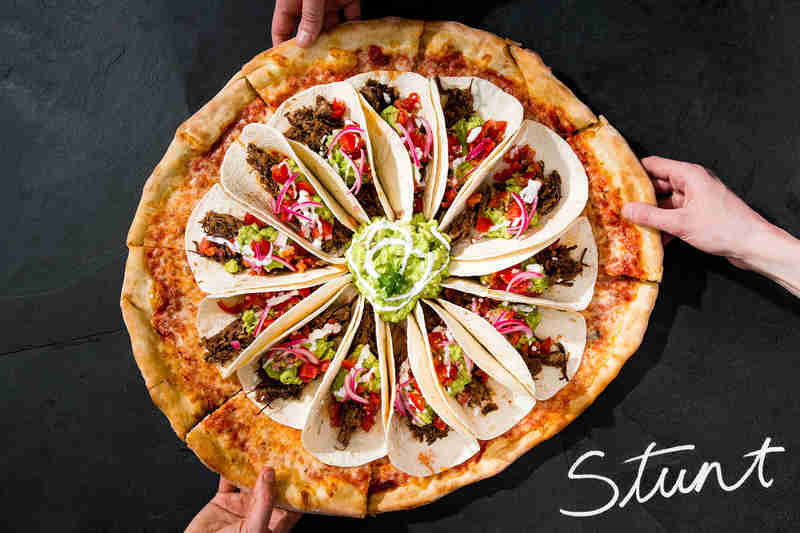 Actually, why stop there when you could use a pizza as a base for an enticing platter of tacos? Basically, it is silly to impose any kind of laws around stunt pizza, because stunt pizza is predicated on breaking them. Where it came from: It depends on your perspective -- as mentioned above, Pizza Hut's introduction of stuffed crust pizza in 1995 could be viewed as the first "stunt" pizza and a successful enough iteration that it spawned its own category. Hell, even the genesis of deep-dish had a certain bit of showmanship to it. But the phenomenon has unquestionably grown with the rise of the internet and "good lord have you seen THIS?" food culture. As far as the inspiration for specific incidents of stunt pizza genius goes, one has to suspect that, as was the case with that aforementioned taco pizza, herbal enhancement may have been involved. Where to get it: Tony Boloney's in Hoboken is your go-to for the taco pizza that nearly broke the internet. A mini-chain born in Madison, Wisconsin, Ian's is known to really push the boundaries with their toppings, with their flagship mac & cheese pizza being a beloved staple. Vinnie's in Brooklyn had the vision to create the pizza-on-pizza phenomenon, along with many other pizza-bending ideas. What it is: It should come as no surprise that in a time when culinary mashups are everywhere and iPhones are arguably just as important a food audience as taste buds, pizza would ultimately morph into sushi pizza (or is it the other way around?). An array of renditions have popped up, but the basic premise has remained consistent: pile traditional sushi ingredients -- think spicy tuna, avocado, tobiko -- onto rice that has been shaped into a circle, slice into triangles (just like pizza! ), and serve. 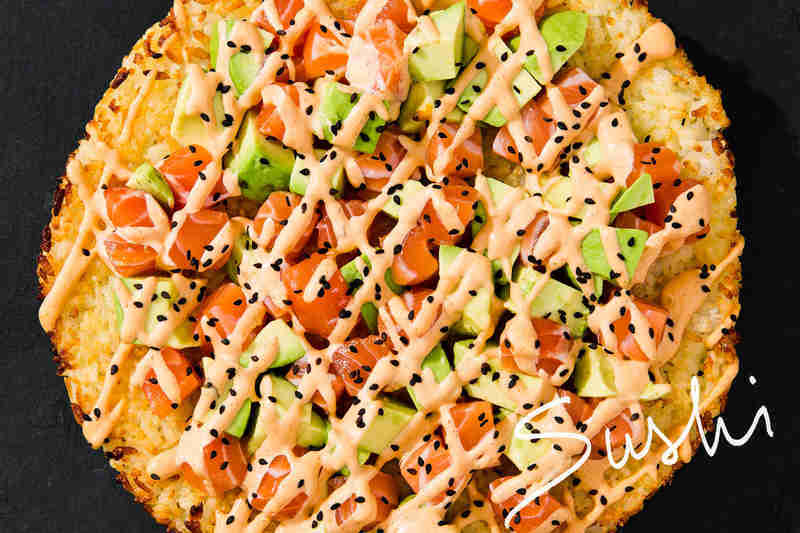 Where it came from: Although the original origin story is fuzzy, the birth of sushi pizza is often credited to a Canadian sushi chef in Montreal who was employed at Atami Sushi in the ‘90s. Nowadays, the hybrid dish has gained fame in the States, buoying droves of pizza and sushi fanatics to line up for a taste (and a photo) of the fusion dish. “NYC pizza is really one of those staples, so I figured I’d put sushi and pizza together,” explains Henry Yang, chef and owner of Alpha Fusion in New York City, who wanted to put his own spin on the viral dish. “A traditional pizza base would be too thick, so we wanted something thinner, crispier.” The kitchen settled on a corn tortilla, piling the crisp disk with raw fish, seaweed salad, spicy aioli, tobiko, and crushed peanuts. Where to get it: Iron Chef Masaharu Morimoto puts a spin on his beloved sushi, pressing thin slices of raw tuna onto a crisp cracker, then drizzling anchovy aioli and tabasco on top. At LA's Iroha Sushi of Tokyo, you’ll find the kitchen’s take on sushi pizza: crispy rice comes flush with pink spicy tuna, shiso, and miso paste. And, as mentioned, Alpha Fusion is your go-to for a sushi pizza fix if you happen to be in NYC. What it is: Tavern pie isn't thin-crust pizza. It's ridiculously thin-crust pizza... like, "sometimes it's pizza on a saltine cracker" thin. Most commonly served in a circular shape (but cut into squares) with toppings greatly varying by location and preference, the tavern pie is a brew-pub staple across the country, particularly in Chicago and throughout the Midwest. As long as the crust is uber-thin and crackery, it's tavern pie. Where it came from: "In the 1930s, when Prohibition was overturned, and bars began opening again, many started adding food to their menus. By the '40s and '50s, a lot of the bars in Italian communities started adding pizza to their menus," said Scott Weiner, pizza expert and founder of Scott's Pizza Tours. But, obviously, making good pizza in a barroom setting presents a set of distinct challenges. You generally need to be skilled in pizza making and have the space and time to let the pies cook properly. Tavern pies were the solution. "Pushing dough in a pan, and being able to cook pies in low temperature, gas-fueled deck ovens that were just hitting the market in the late '40s and early '50s, really simplified the process. It allowed places that primarily served alcohol to serve pizza, too, quite easily," he added. Though it was born out of convenience, over the years people have genuinely grown to enjoy the less-filling, crisper style of tavern pies. It remains a staple across the Midwest -- and now, throughout the entire country, too. Where to get it: Jersey shore icon Pete and Elda's has become legendary for two things: its tavern-style pies, and the colorful, cartoonish T-shirts shirts you get for free if you can finish the extra-large, solo. It's not that filling. So, it's not that hard. In Chicago, Vito & Nick's has been a South Side institution for generations -- don't miss the homemade Italian sausage. Given that NYC-based Emmett's specializes in Chicago-style deep-dish, it only makes sense they have a stellar tavern-style to match. What it is: Let's get this out of the way: there are a few different variations of "Tomato" pie. With apologies to "NJ-style" (which is pretty much an inverted thin-crust pizza) and anything else you might want to slap the "tomato" designation on, we are talking specifically about Philly tomato pie, sometimes referred to as "bakery pizza." It's relatively thick. Always square. And commonly served not piping hot, but decidedly luke-warm with the bottom relatively soft, and not charred. But the big thing about Philly-style tomato pie, is the total absence of cheese. Yes folks -- you can have zero cheese, and still have a pizza. Where it came from: In the early 20th century, scores of Italian immigrants settled their roots in Philadelphia -- specifically South Philadelphia -- and began bringing their culinary traditions along the journey, the tomato pie being chief among them. Since then, the communities that originally embraced the tomato pie may have evolved, but they kept their love of their cheeseless pizza -- even if it' popularity hasn't necessarily spread. "Look, most people's favorite part of the pizza is the cheese. When you cut that out, I think a lot of people don't really consider it pizza. 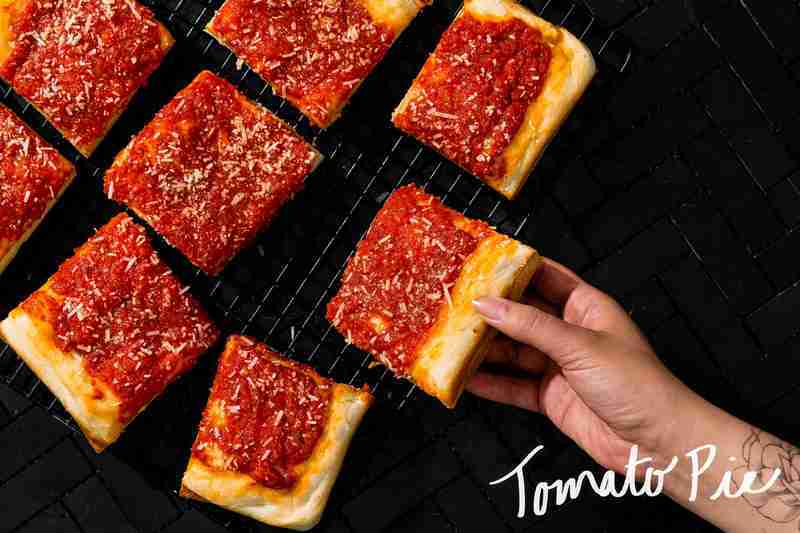 Which would definitely explain why this type of tomato pie hasn't really gained a lot of traction outside of the region," said Scott Weiner, pizza expert and founder of Scott's Pizza Tours. "But when you actually give it a chance, you do realize it's actually pretty good... even if it doesn't have cheese. It's still pizza, people. I promise." Where to get it: Family-owned Philadelphia icon Sarcone's Bakery has been serving tomato pies -- based on the current owner's great-grandfather's recipe -- since 1908. Marchiano's Bakery, meanwhile, has a light (meaning, very light) sprinkling of cheese, and even sells a "take and bake" version of their South Philly favorite that you can pop in your own oven. Serpe's has been making sure Delaware residents don't have to drive to Philly for a quality tomato pie for over 60 years. What it is: Whether or not you grew up tossing back Pizza Rolls, it’s easy to fall in love with trapizzino, Rome’s street food equivalent of the ubiquitous childhood snack. Chefs snip away at the corners of soft pizza bianca, creating a triangular, hand-held bread pocket, then fill the opening with old-fashioned Roman recipes like chicken cacciatore and stewed oxtail. The finished product is slipped into a paper sheath and eaten on the go, just like a slice. Where it came from: Looking for a way to introduce traditional Roman recipes to a younger generation, pizzaiolo Stefano Callegari discovered that by stuffing these dishes into a trimmed portion of pizza bianca, it both revived and modernized these Old World dishes. “Each trapizzino tells you about the history and culture of Rome and Italy,” Callegari explains. “Many of these recipes were in danger of being lost, but we wanted to preserve them by sharing them in a new way.” Now people can actually sample these labor-intensive dishes outside of fancy restaurants or nonna’s kitchen, in a smaller, more manageable arena. 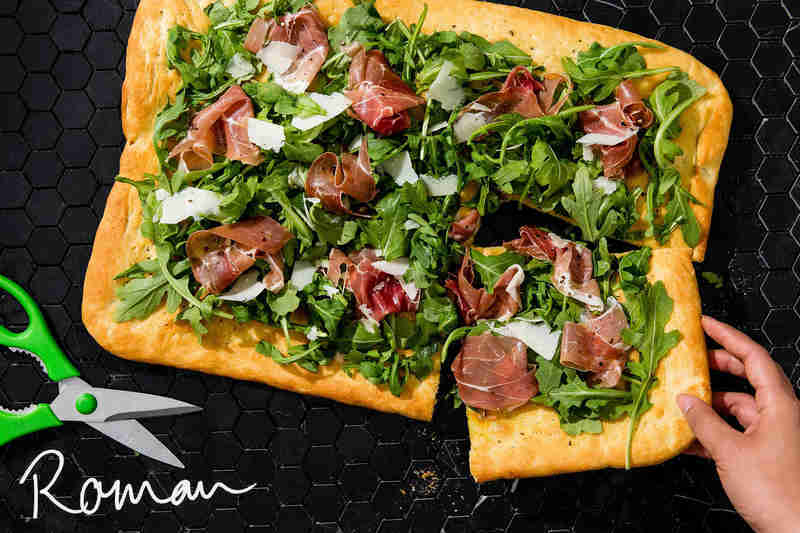 Where to get it: To get a true trapizzino, your best bet is to visit Callegari's Roman restaurant chain of the same name. 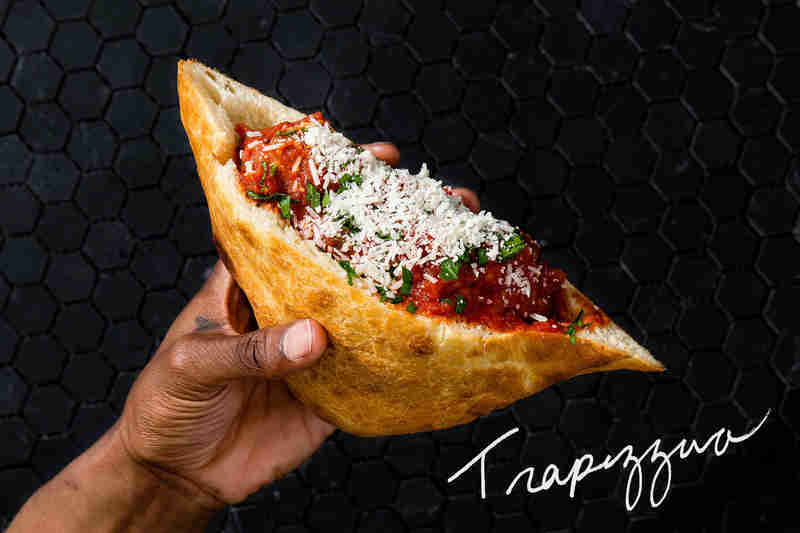 Luckily, Trapizzino now has two outposts in Manhattan, where they're branching into fillings like honeycomb tripe and salsa verde beef tongue.